At least 73 pupils at a Catholic school have suffered forehead burns from ceremonial ashes applied during Mass. St Augustine's Catholic High, in Redditch, said 16 members of staff and the chair of governors were also affected by the Ash Wednesday Mass. First aid was provided and some parents took their children to emergency hospital departments. The school said it was "dismayed" and was investigating what happened during Mass. A priest was drawing ash crosses on pupils in year nine and 11 when some of them began complaining of discomfort. The ashes were being analysed by external experts, the school said. Cassena Brown's 14-year-old son Chairo has a serious burn on his forehead. She said: "He's OK now and he has been at school for the last two days. He's more embarrassed than anything else. "It continued to burn to the end of the night. "I'm absolutely fuming. Every time I see him I can just see this black mark on his face. I'm mortified." The school said it treated students' health and safety as of "paramount" importance. 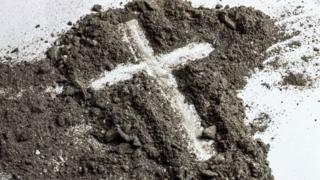 A school spokesman said: "During the Ash Wednesday service for Year 9 and Year 11 students, it came to our attention that discomfort was experienced by some students that had received the ashes on the forehead. "As a result, all students were requested to wash the ashes off immediately to ensure no further discomfort was felt. "The school is dismayed by this event. "An investigation has started and the ashes are being analysed by external experts." Another parent, who asked not to be identified, claimed the ashes were mixed with water before application creating "toxic lye."